When it was announced that President Muhammadu Buhari was going to be visiting Lagos state for an ‘APC Presidential Mega Rally’, emotions were divided as people felt differently about the visit for various reasons. Some felt it was just a political ploy to project a fake sense of goodwill, others hated that it would affect their weekend plans and commute as various routes were to be shut off to enable safe passage for Mr. President, some dreaded the idea of a visit because they simply don’t like him while a lot of people were indifferent and just wanted to see what happens. 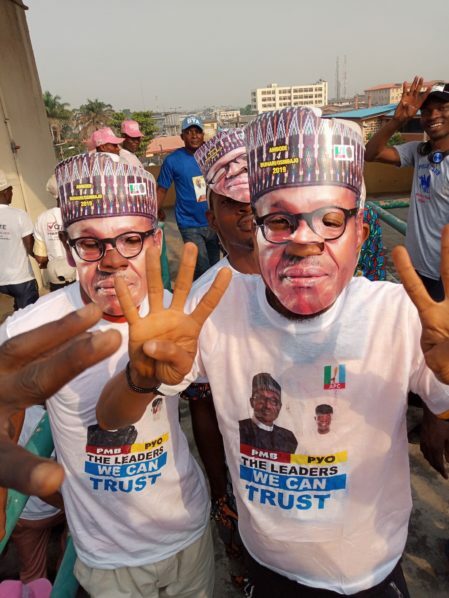 Social media was overflowing with images and videos of supporters and loyalists who were eager to receive the president and even went as far as wearing over the top ‘Buhari face masks’ and APC regalia. The hashtag “PMBinLagos” has been trending all day with over 15,000 tweets so far and there are accompanying videos from the scene of the rally at Teslim Balogun Stadium where thousands have gathered in support of their candidate. More like a Presidential carnival.